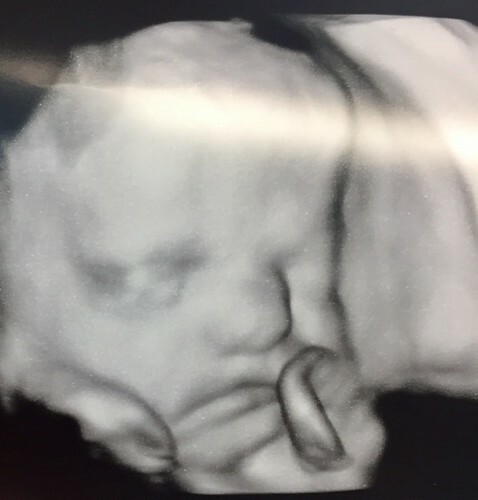 I am currently 32 weeks, 4 days (guesstimate of course–we call this the “Jesus Baby” because in actuality we have NO IDEA when he/she was conceived & joked at the beginning that God must’ve just put it in there, all divine-like). Yesterday at my appointment I measured 32 weeks, 3 days (fundal height–a little measuring tape the doctor uses to measure the outside of my belly). That sounds awesome, right? Baby is perfectly average. Baby is really more like 34.5-35 week size (17.5″ long and over five pounds). Baby is 99th percentile in length, head circumference, and belly size. I think just its cheeks weigh over five pounds! So where is this giant baby hiding if on the outside I’m average? That would be in my lungs. And back. And stomach. And kidneys. And intestines. And poking his dadgum head out of my shredded left oblique muscle half the day (baby is either transverse or breech at all times). I get that pregnancy is not fun in the third trimester, believe me. Been there, done that (twice) before. But this one is the worst. Blame it on the muscle repair from my tummy tuck–my ab muscles are literally sewn shut and are pushing this gigantic baby back inside my body. I can’t even really describe it because it’s nothing like my other two pregnancies. I can’t breathe and my stomach is so sore–like I’ve done 1000 sit ups or slept on a cement floor. And then there’s the whole gigantic baby thing and the guilt I have over it. See, when you have gestational diabetes you’re told over and over that if you don’t control your blood sugar you will have a giant baby and that is very bad. Therefore big baby is a sad and sick baby = mama who didn’t follow the rules/didn’t eat right/horrible piggy of a person. Now, the doctors have never called me a horrible piggy of a person, but it’s how I feel each time when I’m told my baby is big. I remember always being so proud that Lawson was on the small side (20-30th percentile) because I knew it was because *I* was doing something right. So to hear this one is in the 99th percentile (it’s been 95th percentile since 11 weeks) it makes me feel like *I’m* doing something very wrong. I record every bite that I eat. (I eat 1,200-1,400 calories a day and less than 50g total carbs). I record my blood sugar religiously. I workout every single day. I take a minimum of 15,000 steps a day. My blood sugar numbers are perfect (other than my fasting 2-3 days a week, but you honestly can’t control those). I’ve been told by both my high risk OB and regular OB that I’m the most active patient in their practice right now. We did another A1C last week to see how controlled my blood sugar has been the last three months and it is 4.5 (which is unheard of perfect, if I do say so myself). I’ve gained 18.5 pounds at 32.5 weeks which is completely average. My baby is huge (predicted size if I made it to 40 weeks…which I won’t, thank the lord…TEN POUNDS). And the guilt I feel is unreal. And yet I still feel guilty.